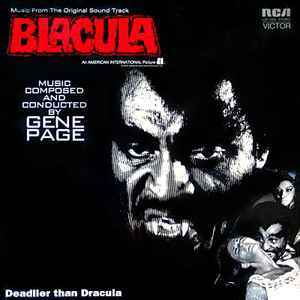 Blacula - Deadlier than Dracula! © 1972 American International Pictures, Inc.
Dynaflex is the RCA trademark for a new developement in record manufacturing that provides a smoother, quiter [sic] surface and improved ability to reproduce musical sound. This lightweight record also virtually eliminates warpage and turntable slipage. TMK(S) ® Registered • Marca(s) Registrada(s) RCA Corporation © 1972, RCA Records, New York, N.Y. Released approximately in early 2000s. I had a copy of this unofficial pressing but sold it. It seemed to be sourced from a very weak sounding needledrop - awful mastering!